Ween is an American alternative rock band formed in New Hope, Pennsylvania, in 1984 by childhood friends Aaron Freeman and Mickey Melchiondo, better known by their respective stage names, Gene and Dean Ween. After meeting in a middle-school typing class, the two began playing music and immediately chose the name Ween as well as their Ramones-inspired pseudonyms. Ween performed as a duo backed by a Digital Audio Tape for the band's first ten years of existence before expanding to a four- (and later five-) piece act. The band's highest charting single is "Push th' Little Daisies", which was a hit in the United States, New Zealand and Australia. 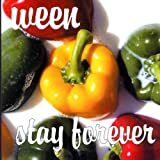 While Ween is generally categorized as an alternative rock band, they are known for their highly eclectic catalog of songs inspired by funk, soul, country, gospel, prog, R&B, heavy metal, punk rock, and more. Despite never receiving much mainstream recognition, Ween developed a large, devoted cult following. After a 28-year run, Freeman quit the band in 2012, citing the need to focus on his alcohol and drug addiction issues. In November 2015, Ween announced a February 2016 reunion for three shows in Colorado, with later dates subsequently announced.